The list of reasons to be excited about Rittz in 2013 just keeps growing. First of all, dude has already proved himself to be one of the dopest features you could possibly get on a track. Secondly, he was just nominated for XXL’s Freshman Class of 2013, which is a HUGE deal. 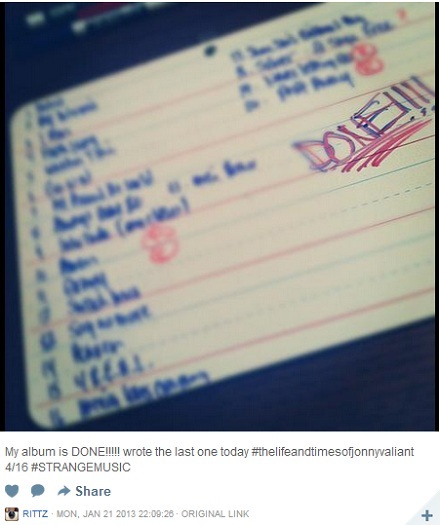 Now, we’ve received confirmation that Rittz has completed writing for his Strange Music debut The Life And Times Of Jonny Valiant! Recently, Rittz took to his Instagram to tease fans with this photo, proof that the writing portion of The Life And Times Of Jonny Valiant is complete. Who do you hope to be featured on Rittz’s new album? Do you you plan on seeing Rittz on the Independent Powerhouse Tour?